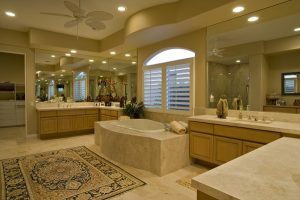 Do you want to remodel your master bathroom? There may come a time in your life as a homeowner when you need to expand and upgrade your bathroom. Whether you want to install a new countertop material or design a whole a new shower, remodeling your bathroom will take time and effort. There are several aspects you need to be knowledgeable about including the dimensions of the space and material options. Luckily, there are a few simple tips you can follow when planning your bathroom remodel. One of the most important elements of any bathroom design is the vanity. In many bathrooms, the vanity is the focal point, so you want to design one that fits in the space well. You want to take the dimensions of your bathroom into consideration so that your vanity is not too large that it takes up the entire space. You also want to choose a material that is durable, as well as, aesthetically appealing. Marble and granite are in high demand among homeowners for bathroom vanities. When it comes to remodeling your bathroom, you need to focus on how you will light the space. You want to have a balance between task, decorative, and ambient lighting. It is important that your vanity area is well-lit considering you will be getting ready in the morning in front of a mirror. If you have windows in your bathroom, you want to let in as much natural light as possible. When planning your bathroom remodel, you need to take into the space you have to work with. If you are limited on square-footage, then you need to get creative when designing your new bathroom. You should think about installing a sink in the corner of the bathroom so you can save on space. A corner sink opens up the space and prevents the door from swinging into the structure. This entry was posted on Friday, October 5th, 2018 at 11:54 am. Both comments and pings are currently closed.